Editorial note: From Nakts pragmatike (2000; Night pragmatist). We ride out past sandy tracks through the spruce forest, heavy apples hanging from a tree—it is so fecund. Pale algae shimmering, a plenitude of lichens, ferns turning bronze and gold. The station I get off at is an hour from Riga, just before Sigulde, and no one else gets off there. Only forest all around; I think, You’d have to wave for the train to stop, going back. Gunars appears to pick me up in an SUV; getting out and shaking my hand, he says, “So we meet in the middle of the forest this time!” He and Inga stayed with me when she made her first trip to America in 2006, Gunars participating in the hot-air balloon festival in Albuquerque, where I then lived, and I read translations of Ābele’s poetry while she stood beside me for the Words on Fire series. They live on a smallholding that belonged to a baron in the 1800s: wild boars come at night to dig up the lush grass with their snouts and eat it. A tower is set up for a neighboring hunter who hasn’t had any luck yet. They’ve built a perfect, snug house on the foundations of what was once the cattle shed, with the weathered old outbuildings still standing about, a great stack of wood ready for winter. Gunars takes haunting photos of the countryside of Latvia while floating over it. Inga asked me to come between 9 and 11am, because she has a three-week-old daughter who naps during that time. She is finishing up a novel titled The Wicker Monk, which has been three years in the writing. The “wicker” in the title comes from the way in Latgale, where the protagonist lives a life of celibacy, everything is woven together for strength, large families hold together. After that she has a contract to write a historical novel about collectivism in the 1950s in Latvia, due to be finished in 2015. “Latvian history has had little dramatization in Latvia,” she says. I ask if Dark Deer, and this work, are social realism, and she says no. “A novel is a dramatic work,” she says. “From documents, you can’t tell what really happened.” But she tells me that she did write Dark Deer while a student, wanting to protest and change the social conditions in Latvia. She is reading the Alexandria Quartet, and the language engrosses her, its use. She considers that she only has one “real” book of poetry out, Night Pragmatist, because Atgazene Station is prose poems: she has new poems, including the cycle she wrote on her flying visit to Mexico after visiting Albuquerque, and intends to pull them together into a collection. I promise to translate. The baby wakes, and is so content, smiling and waving tiny hands. Inga has named her Lena after her grandmother, much loved and written about in poetry, especially the long poem “Elysian Fields” that closes The Horses of Atgazene Station, and Alexandra, after the Alexandria Quartet. She is a generous, warm person, finding me books that came out recently that I might like to translate. She tells me that she made the most money this year from the sale of a screenplay to China; she had it up as available on a Russian website. Her nineteen-year-old son had fallen in debt to loan sharks, and she was being pressured to sign the documents to cover the debt for him at immense interest; the funds came through in the nick of time. Inga gives me a jar of honey that I can have in the morning at the hostel where I’m staying in Riga, and Gunars drives me back. Her life deep in the forest and her literary success early in life are like a dream. 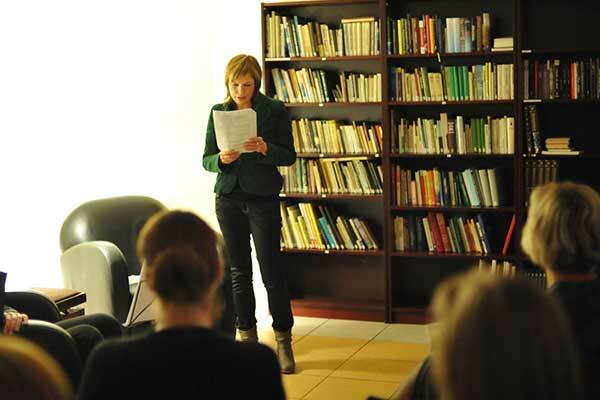 Ābele was honored as Writer Laureate at the 2008 Prose Readings festival in Latvia, and in the same year her novel High Tide received two prizes, the Annual Literature Prize and the Baltic Assembly Prize for Literature. She was also a recipient of a Prose Readings appreciation award in 2009. Inara Cedrins is an artist, writer and translator. Her anthology of contemporary Latvian poetry written while Latvia was under Soviet occupation was published by the University of Iowa Press, and her new Baltic anthology, three books of poetry from Latvia, Lithuania and Estonia, has been published by the University of New Orleans Press, with her prints as cover art. She guest-edited a section on contemporary Baltic poetry for the November 2008 issue of WLT, and two of her own illustrated poems appeared in the July 2008 issue.